Hand washing and hand sanitizing each have their optimal applications. Generally, hand sanitizing opportunities exist outside of washrooms -- where there is an absence of water. Hand sanitizing, like hand washing, is considered by the World Health Organization to be a primary, effective, and cost-effective method of preventing and reducing bacterial and viral infections. 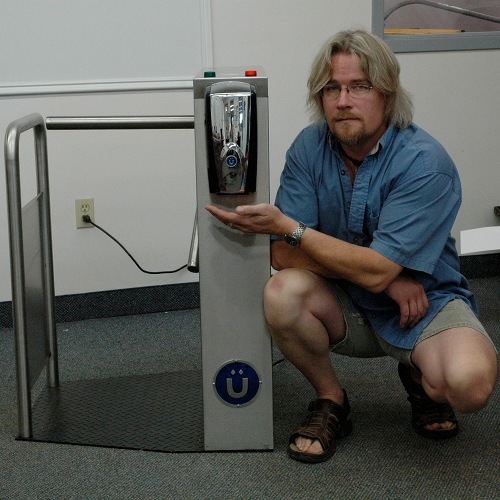 The Überloo Hand Sanitizing Turnstile™ combines proven turnstile control with hand-sanitizing compliance. Persons approaching the turnstile are welcomed by a distinctive light array directing them to the hand sanitizer device. Hand sanitizing compliance turns a red light to green, and the turnstile subsequently is operable allowing a person to pass through. The Überloo Hand Sanitizing Turnstile™ is available in either a traditional 3 arm style or as an optical turnstile, depending upon the location requirements. Options include stainless steel finishes, one direction or bi-directional, counters, RFID capability and web enablement. Überloo is committed to providing barrier-free access for those in need: mothers with babies in strollers; persons using crutches, walkers or confined to wheelchairs; and the vision and hearing impaired. The Überloo Hand Sanitizing Optical Turnstile™ is fully adaptable to meet those needs (complying with ADA Accessibility Guidelines) while promoting hand-sanitizing compliance. Persons approaching the turnstile are welcomed by a blue light directing them to the hand sanitizer device. Compliance turns a red light to green, and the person proceeds through the lane.